Not everyone puzzles the same way. Developing a unique approach to a puzzle or challenge that works for the individual is the most important aspect of mastering the craft. These pictures and/or suggestions derive from personal opinions and are meant as guidelines only. They are in no way hard and fast rules as to the "correct" way to do this puzzle or game action. Ahoy there me hearties. I be Master Carpenter Hawkings and will be yer instructer. So ye want to learn to carpent? Well ye have come to the right place. Grab yer toolbox and come aboard the Masterful Sawfish and prepare to learn how to become one of the oceans ultimate carpenters. 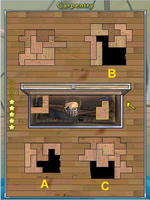 The Carpentry puzzle is one of the six duty puzzles of Puzzle Pirates. As a duty puzzle, Carpentry is always free to play since it is integral part of pillaging, which is the heart and soul of Puzzle Pirates. Carpentry is often considered one of the least important of the duty puzzles because it does not have a direct effect on the operation of a ship. Carpentry instead affects how fast bilge enters the ship. A ship with its red, Carpentry damage meter nearly full means that bilge enters the ship at a rapid rate. If that rate exceeds the bilgers’ ability to pump it out, the blue bilge meter will fill up which in turn reduces the sailors’ ability to generate movement tokens during sea battle as well as increases the time required for a ship to build up speed when sailing across the ocean. During a blockade, Carpentry can be crucial. During blockades it is the job of the carpenter to keep his ship afloat and contending for flags as long as possible. In any case skilled carpenters are needed to keep the ship performing at maximum efficiency. It is the carpenter’s job to repair the normal wear and tear on a ship that it accumulates as it maneuvers across the ocean, as well as repairing damage taken by the ship during Sea Battle. The ultimate goal of carpentry is to fill the carpentry puzzle holes as quickly and as efficiently as possible. A beginner at carpentry starts out with a single hole and three pieces that will perfectly fill that hole. When a carpenter has some basic skill and experience he/she will start out with four randomly sized holes to fill and three random pieces to use in filling those holes. The Carpentry puzzle is made up of thirteen different pieces. Each piece is made up of five blocks oriented together in a pattern so that each block is adjacent to at least one other block. There are twelve combinations of five blocks with each piece covering one of the combinations. There is in addition, one special piece that will fill any of the piece combination. This piece is the Putty Bucket. 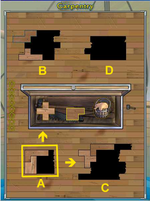 These ten pieces are your tools for working the carpentry puzzle and utilized in the correct combinations can make any standard hole a Masterpiece. Each piece has a set frequency as to how likely it is to appear in the toolbox. The most common piece is the P and the rarest piece is the Putty Bucket. 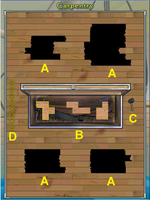 The pieces can be broken into the following categories with the number after the piece being the number occurrences the pieces will show up when 95 pieces have been selected. So the P pieces comes up roughly 22 times out of every 95 pieces. Common (P-22, F-14, Y-14) – These pieces are almost always guaranteed to come up if you are patient in waiting for them to get a masterpiece. Uncommon (L-8, N-8) – These two pieces are likely to come up if you are patiently waiting for them to complete a masterpiece. Unreliable (T-7, U-4, V-4, W-4, Z-4) – These pieces are at best unreliable in coming up when you need them. They do come up but you should be prepared to try and get a Grain Bonus if you need one of these pieces to complete a Masterpiece. Rare (X-3, I-2) – If this is the shape needed for the last piece for a master piece you are almost assured of having a booched hole. Very Rare (Bucket-1) – This piece can save your bacon on a hole that is in the position of being booched or having a piece fly off. Use them wisely and when you need them. In this puzzle all holes must be tended to. Holes ignored for to long begin to degrade. An empty hole that has been ignored will begin to flash. You will then have three turns to place a piece in that hole. If you do not place a piece there within that time you will here a cracking sound and the puzzle will grow by one square and rendering the hole impossible for a masterpiece. The flashing becomes more rapid each time a piece is not placed in that hole. If a hole has at least one piece in it and is ignored for too long then the last piece placed in that hole begins to shimmy. Once it does you will have two turns in which to place a piece in that hole. If a piece isn’t placed within that time the shaking piece will fly out of the hole and will render the hole impossible for a Masterpiece. Now that ye know this ye should use that knowledge and take full advantage of each hole. If ye are within two pieces of completing a master piece and you have one of them in your toolbox try to save that piece as long as ye can before placing it to maximize yer chances on completing it fer a Masterpiece. If ye delay, ye can have up to twelve turns for the right piece to turn up. With this many pieces ye are all but guaranteed the right piece and if ye plan yer hole correctly ye’ll you’ll be able to use multiple pieces in conjunction with the one in yer toolbox already to complete the Masterpiece. Left Button – Picks up and puts down pieces in the toolbox and the puzzle holes. Right Button – Flips the current selected piece horizontally. Mates ye should use a mouse with a wheel if at all possible. The puzzle can be worked faster and easier using a mouse than using the keyboard. Speed is critical in getting an Excellent or Incredible quickly. In me own experience using the keyboard just slows the puzzle down. Mates if ye be like me ye often booch the placement of a piece because yer moving so fast. One trick that all aspiring carpenters need to learn is that ye can pick up the last piece ye played as long as it didn’t finish a hole. Just select it again. At this point ye can only shift it around a bit but if ye booch a hole inadvertently ye me be able to move it enough to correct the booch, reposition the grain or even take advantage of a piece that just appeared in yer toolbox. Just make sure ye get it right the second time as ye can only pick it up again once and only if ye haven’t selected a piece in yer toolbox. This can be very handy fixing a booch or completing a Masterpiece. Each hole may be filled perfectly with the available pieces. This is called a Masterpiece and is the base for scoring that particular hole. If you think of a hole having a base score of 4 then each piece used beyond the number needed for a masterpiece reduces the score by 1 down to 0 for each extra piece used. Masterpiece! – Hole filled with the minimum number of pieces possible. Craftsmanship! – Hole filled with one piece more than the minimum possible. A Fair Job. – Hole filled with two pieces more than the minimum possible. Sloppy Work. – Hole filled with three pieces more than the minimum possible. A Pig’s Breakfast! – Hole filled with four or more pieces more than the minimum possible. Masterpieces can be chained for increasing bonuses. (Masterpiece!, Masterpiece2!, Masterpiece3!, . . ., Masterpiece18!) Each increase to the chain increases the bonus for that completed hole. The bonus counter is reset after 18 and after the Star Meter has filled and a new set of four holes are started. The Masterpiece be the highest scoring of all available bonuses. If ye have a choice in getting a Masterpiece, Grain Bonus or Set Bonus ye should always go for the Masterpiece especially since the Masterpiece Bonus is cumulative. Ye should always work towards a Masterpiece. Each piece as it comes into play has a grain on it just like a real piece of wood. The grain always runs left to right when a piece first appears in the toolbox. Pieces will appear in a random oriented direct with the exception of the four pieces the Y, L, N and I. These pieces will never appear with the grain going across the short side but will always run the length of the piece. Because of the grain on the Y, L, N and I you should always place pieces so that the grain runs horizontally if possible. There are three special pieces that can always be used in with the grain horizontal. The V, X and W pieces are such that if flipped and rotated properly they can always be positioned with the grain horizontal no matter which direction they face when they first appear in the toolbox. If you know a hole is going to be booched then try to get the grain bonus from it. This is especially easy with small holes requiring 4 to 5 pieces to fill normally. Next to the Masterpiece the Grain Bonus is almost as good. It be very helpful to places pieces horizontally whenever ye have a choice even if the hole already has the grain bonus booched. If ye train yerself to always position pieces horizontally you’ll increase your chances of getting the grain bonus even when getting a Masterpiece, which can really give yer score a boost. Always place the V, X and W so that the grain runs horizontally. When using the Y, L, N or I, ye should avoid rotating if possible. If ye have two of any of the other pieces one standard and one laying on it’s side try to use the one whose grain runs horizontally in the location you wish to put the piece. I be forever picking up a piece and putting it back down in favor of picking up an identical piece that is orientated in the direction that will keep the grain horizontal. But, never, ever go for the Grain Bonus over getting a Masterpiece. Another possible bonus can be achieved by using all of the same shaped piece in one hole. This is generally easiest to do with the P and L shaped pieces in small 4x5 square holes but can be accomplished on larger holes and with other pieces. Like the Grain Bonus this aids in scoring but should not be done at the expense of a Masterpiece. Outside of the P and possibly the L pieces other pieces are generally not reliable enough to get enough of the same piece to fill a hole completely or because of their shape are more difficult to attempt to use in this manner. If a hole is going to be booched any way you can try to use pieces to complete a hole for this bonus. I have found it be very easy to use the P pieces in rectangular holes fer the set bonus. The 4X5 and 5X6 holes are the easiest to achieve a Set Bonus on and can usually be completed as a masterpiece as well. If ye get a booched hole I have also found that using the Y piece to be a good piece to use on this bonus because of its frequency and longer shape. When working a hole in carpentry it is best to work a hole from the outside and collapse it in on itself. The more square the hole is the easier it will be to complete for a Masterpiece. Cutting across a hole and creating bottlenecks will often result in a booched hole. This is because you will have less options on which pieces will fit in a hole for a Masterpiece. This coupled with the fact that the P piece is the most common piece to have makes square holes the easiest to fill. The example in Figure 3 shows a hole that has been squared nicely. This particular hole should be fairly easy to complete as a masterpiece. It would also be very easy to reduce this hole to one of the 3 most common two-pieces holes that will be described later. Mates when ye have squarish holes to work with, ye’ll find that Masterpieces will come naturally. As long as ye have room to work in the middle it will be easy to control the hole and make sure that ye end with a P, F, Y or another fairly common piece. Just remember to work a hole in on itself. It is generally best to focus on completing one or two holes at a time. When new holes show up gauge which one is the smallest of the four and concentrate on making a Masterpiece out of that one. Typically there will be one or two that will require 4, 5 or 6 pieces to complete. If the other holes are largish then these small holes will be the ones you will complete first anyway whether they are a Masterpiece or not. An example of this is point A in Figure 4. In this case the hole is small and square and will be easy to complete quickly. Once you have identified the smallest then take note of which of the adjacent holes is the next smallest. This will be your secondary target. In the Figure 4 example this is likely to be point B. The other adjacent hole can also be a target but if it is largish then it becomes a great place for pieces that do not aid in completing either of your targets. In the Figure 4 example this would be point C. It is also smallish so you should be prepared to switch the secondary focus if pieces come up that could be used to complete it quickly, Ys, Ns or Vs work well in this hole. The hole diagonal from the smallest hole should be the one you place the fewest pieces in unless for some reason it is also small. This is point D on Figure 4. Since it is also smallish you will want to delay placing pieces in this hole until the last moment. The goal is to complete the primary and the secondary targets. When this is accomplished you will be given two fresh holes. You continue this process until you complete the round and get a complete set of four new holes and you start up all over again. The off holes, especially the diagonal one, should be delayed as long as possible, as long as you are keeping the primary holes squared off nicely. When working yer primary and secondary holes be flexible to adjust yer play if the other adjacent hole looks like ye could compete it quickly. The ultimate goal be to complete two holes in tandem quickly so ye’ll get fresh holes. Having all four holes close to completion at the same time often leads to booched holes especially if odd pieces come up. It be easier to utilize the odd rare pieces in a large hole rather than in a small hole. Placing an odd piece in a large hole gives ye lots of room and lots of time to fill in around it, where as placing it in a small hole can be very limiting and lead to booched holes. Also having a couple of holes that are pretty large that ye can place pieces in when they won’t fit elsewhere, gives ye a place to play the annoying I and infernal X when they show up to plague yer toolbox. This is probably the most critical strategy for stringing Masterpieces together and elevating your Carpentry score to Ultimate and beyond. Once you work a hole sufficiently and assuming you have kept it relatively square you will eventually come to the point where you will need two pieces to complete the hole for a Masterpiece. You will be trying to work the hole so that the last two piece hole is one that a combination of common pieces will complete it. You should leave one of the following two-piece holes whenever possible. Top-Notch: This hole is the easiest hole of this size to be filled and as such is superior to all other two-piece holes. It can be filled by PY, PL, PT, PV, PZ, FU and YU. In each case one of the 3 most common pieces are required, and one combination requires two of them (PY). The best combination utilizes the P piece and any one of 4 fairly common pieces. In a pinch also by the U which matches with two common pieces. If you have a choice in the shape of your 2 piece hole this is definitely the one to go with. The rate of a match in combination with the P occurs twice in every five pieces. Dogleg: This piece is nearly as good as the Top-Notch being completed by PP, PL, PU, LN and VZ. As with all the best two-piece holes this one combos the P with three other pieces one of which is another P. The frequency of a piece coming up to combine with a P is roughly one in three. In the case of this hole either the P, L or U are great pieces to wait on. LN isn’t bad but you probably shouldn’t try it unless you have both at the same time or you are in the position of needed P pieces for 3 or 4 holes at the same time. I do not recommend trying to complete this hole with the VZ as it is not reliable enough to count on. Dome: This hole can be filled with PP, PL and PW. It is nearly identical to the Dogleg but slightly less useful as you have to have two Ps to complete it but since 90 % of the time you’ll be completing holes with the P anyway it doesn’t really matter much as typically a the Dogleg is not completed with the VZ combination and only occasionally with the LN combination. The frequencies of matches for the P is identical to the Dogleg at one in three. It is also interesting to note that if you hold onto a P piece and wait for one of the other three to show up you’ll be pleasantly surprised that the W will come up giving you a nice use for it where it otherwise might have been the source of frustration. Middle-Notch: This can be completed by PF, PN, PV and UX. Again the P piece is the key piece that can be combined with 3 pieces that do show up fairly frequently especially if you combine their frequencies. The rate would be between 1 of them in about every 3 or 4 pieces. I have found that I rely on this hole just as much as I rely on the Top Notch and the dogleg. The F and N pieces are both common enough that if you are patient and wait on them, you should get them without trouble especially when you throw the V in to the mix. You should not rely on the UX at all as the X only comes up when you absolutely don’t want it, but if you have them both at the same time then by all means you have a nice safe place to put the X. Animal: This hole can be completed PP, FV and LU. Not the greatest two-piece hole in the world but you don’t usually go wrong with PP. Also if you already have a V or U in your tool box you also have the advantage of searching for two other common pieces to use. It is definitely worth leaving it if you have either the V or the U and have a large hole for odd pieces still while you search. Make sure you are careful however when you leave this hole. Usually you should be able to leave the Dome or the Dogleg rather than this hole which are much more reliable. Usually this can be accomplished by flipping the direction of a piece such as the Y or the F.
Offset: This hole can be completed by PP, NN, UU and WW. It is not great but needing two Ps is never a bad thing and NN may come up as well. If you are like me at all, you will often have pieces come up in pairs or triplets. When you have this hole it is often worth while to hold the N, U or W a turn or two if you can just to see if you’ll get a matching pair. Don’t wait it out too long if it would cause you to give up a P as that could spell disaster. The P shaped piece be yer friend. I recommend holding on to at least one whenever ye are close to being about to complete a Masterpiece. Most of the common two-piece holes require the P or the P can be used to complete it fer a masterpiece. As long as ye can keep playing pieces that keeps yer holes fairly square, I would recommend holding onto your P pieces. They are much more usefully in completing holes nearly finished than using them in a hole ye haven’t gotten very far on. Lazy Animal: This hole can be completed PP, FY and YI. Again with PP this makes a great hole although FY is also worth waiting on. If you already have the I then you can wait on the Y for a little variety in all those Ps. It can worth leaving if you have the F, Y or I. This hole is especially good if you have worked yourself into a position of needed a lot of P pieces because of having all 4 holes being equally small, you have had a drought of P pieces or you already have the FY combination. The FY combination adds nice Masterpiece diversity if you already need P pieces especially if you are at the end of a round. The Ship: This hole can be completed PP, YV and NT. PP should make completing this hole easy, although the other two combinations aren’t bad if you have the V or the T already. In either case you are likely to have the piece needed to complete it just don’t place the off piece too early to make sure you have the optimum amount time to complete it for a masterpiece. The trick with this hole is not to be too impatient to place the rare pieces. They may be difficult to work around sometimes and you may feel you are limiting yourself too much but in the end I cannot say it enough that patience is the key to this puzzle. Rushing this hole will likely end it in a booch. The Rectangle: This hole can be completed PP, LL and II. Again PP is the way to go but LL isn’t bad. Only do II if you have both pieces already even if you wait a turn or two to see if a pair will come up. Don’t leave this hole if you already have need of several P pieces. It is however a good hole in a pinch as the P is plenty frequent enough to provide both pieces to complete it. Wait as long as possible to place a piece in this hole even if it’s the P and you should do fine. Really mates any two piece hole that ye have one piece for already and would leave either the P, F or Y are great. The trick is to save the piece that will fit in the hole until either ye have the mate fer the hole or till the point where ye will loose a masterpiece if ye don’t play the piece in the hole. Either way yer chances of making the hole a masterpiece are great. 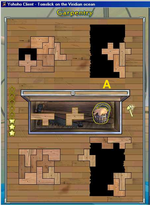 Remember patience usually pays off in the Carpentry puzzle. Starting up from scratch is one of the crucial places in carpentry. When you first start up Carpentry you’ll have a dead black hammer. The best way to get to that flying sparkling hammer is to complete two Masterpieces as fast as you can with a Grain Bonus if possible. To do this it is crucial to focus completely on two holes one each at a time. It takes two Masterpieces to get to the sparkling flying hammer. The faster you get them the better chance you have on getting a first League Point incredible. The more Masterpieces you can get in before the League Point improves your chances of getting that incredible but it is the first two that is the most critical. The quicker you can get to sparkling, the better your score will be. With a little luck you will have a 4X5 hole and start out with Ps, Ys and Ls. If you have them, use them on that small hole and ignore the other holes. After the first is done do the same to the second only going after the off holes if you’ll cause the hole to be booched otherwise or you have no pieces that help you complete a master piece in the first holes. Getting two Masterpieces quickly will guarantee you at least an excellent on the first duty report. I have read many tip guides that advanced carpenters recommend working all four holes at once. I’m not sure what they are referring to on this point. If they mean keeping all four in mind then I agree. If they mean working all four down at once then I think they are nuts. By keeping one if not two holes on the largish side you keep your options open. I am sure any pirate who has done much carpentry can attest to have gotten three or four Xs or Is in a row. If all your holes are small then you are pretty much hosed on what to do with them. If you have a couple of big holes on the side, these pieces will be easier to use and keep your Masterpiece string alive. The most dangerous place to be in is to have all four holes within two to four pieces of being complete. If you don’t get the right pieces in the right order you could end up with four booched holes in a row. In Figure 5 you can see that Hole A has been largely ignored. To this point the only activity performed on it is to keep it from booching and to use it as a home for pieces like the X. In it’s current state once focus switches to it, it will still be easy to complete as a Masterpiece because of the large amount of space yet to fill in it. Ye should always try to leave one hole completely ignored except when it is about to become booched and preferably this hole should be diagonal to the hole ye are most likely to complete first. Doing so allows ye to have places to put pieces that would otherwise you be very difficult to work around. In me own carpenting the only piece that I still hate to see come up is the infernal X piece, especially in multiple. If ye leave a large hole then ye’ll have a better shot at dealing with a awful string of pieces. Even when I get an X piece I do not get concerned unless all the holes are small or I have gotten several in a row. The X may still not be yer friend and mate but ye should be able to deal with them better. This can be one of the trickiest parts of the puzzle. How do you gracefully end and string masterpieces all the way out? This is the part of the puzzle where giving more focus to all the holes simultaneously comes into play. You will also need to be more creative with how you place pieces. Too much reliance on the P can get you into trouble when working the last couple of holes. Squaring is still important but leaving good locations for Fs, Ys and Ns help more at this point. The best policy is to take a little extra time and place piece so that other pieces that are already showing in your toolbox have a logical place to go next. At this point your options for pieces is much more limited and you have to work more on making your pieces fit together better since you won't have a large hole to place rare pieces. At this point it is wise to play the rare pieces immediately if there is a viable place to work around them. Keeping the grain bonus is also important to keep in mind. A Grain Bonus at this point will do wonders for you until you can get to four holes again. End of the round is the best place to give up on a Masterpiece sooner and focus on making sure ye get the Grain Bonus. It is much more difficult to keep a Masterpiece Chain going at this point. Ye should keep that in mind when working the last four holes in the round. It also be worthwhile to take greater risks on shapes of pieces at this point. Leaving holes for Fs, Ys, Ls and Ns more often can help keep a masterpiece going through the end of the round. The absolute best thing you can do for your Carpentry rating is be patient. Don’t be overly eager to place pieces. Wait till the last moment to improve your chances of getting the right piece to complete the hole and do it two or three pieces before the last piece is placed. Also don’t hesitate to leave a hole that needs just one more piece no matter what shape it is. It has never ceased to amaze me at just how often the puzzle will give you the right piece even if it waits till the last move even if you are looking for a W or an I. Patience and planning are the key to Carpentry. When you have both down you’ll soon become the ultimate carpenter you’ve always dreamed of being. This page was last modified on 11 September 2014, at 13:46.